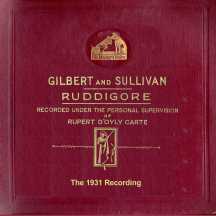 This was D'Oyly Carte's second recording of Ruddigore, following on the acoustically-recorded 1924 set. Three singers (Baker, Oldham and Fancourt) reprise their roles from the earlier set. 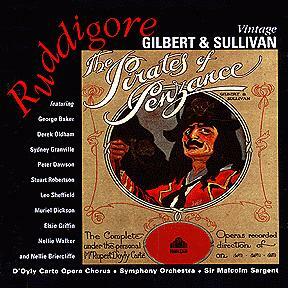 Among those new to this set, Sydney Granville appears in one of his best roles, and Nellie Briercliffe, perhaps the greatest D'Oyly Carte soubrette ever, appears in one of the best women's parts in all G&S. 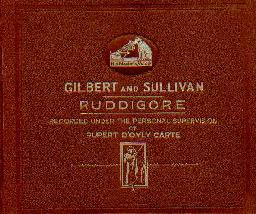 A comparison of the two recordings shows that the pruning of Sullivan's score often attributed to Geoffrey Toye was in fact the work of more than one musical director. For example, "The battle's roar" is included on the earlier set, but excluded here. Bruce Miller points out that it was published in America in July 1933, but "by the end of WWII it was removed from the main catalogue and relegated to the "Request" catalogue. Thus the relative scarcity of the US issue seems explained by its release in the worst year of the Depression and its early removal from the regular catalogue." This recording was re-issued on LP by Arabesque. The re-issue fills out extra space on the second disc with excerpts from several of the earliest acoustical recordings, some of which have never been re-issued in any other form. It is a set worth having. Wow. This really is a top class recording, and yet I had never realised it until quite recently. This is what comes about when you are always blowing hot and cold about an opera. 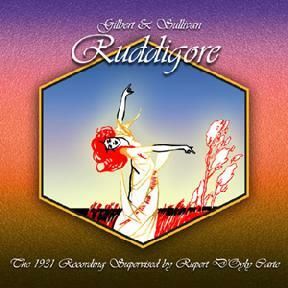 I expect that when I have listened to it in the past it has been while Ruddigore has not been in my good books, but now that I have heard it during a period of liking Ruddigore I am really impressed. This must surely be the best thing that Oldham ever did (certainly as far as G&S recordings go). His "I shipped, do you see" is a joy, and above all it is fun to listen to because you can hear that he is having fun singing it. Unlike the Fancourt situation between the 26 and 36 Mikado recordings, where he is inferior in the second recording (although he does redeem himself in the 1950 set), Fancourt as Roderic is every bit as good here as he was in the acoustic recording. Perhaps he comes across even better because of the superior method of recording. Unfortunately though, the recording engineers messed up at the start of the second verse of "The Ghost's high noon" — they brought the mics down for the choral interjection at the end of verse one and were late bringing them back up again for the start of verse two (a minor point though). I think that Robin Oakapple is a very difficult role to put across in music only, but here Baker manages it very well indeed, although not as well as Green did in 1950. Incidentally, on this occasion Baker does not replace Lytton, but replaces Green who had taken the role off Lytton in anticipation of Lytton's retirement. Gill is quite acceptable in what I think can be pretty dull music unless the words are given their full potential. It takes a contralto of greatness to make Hannah's first song a top number, and good as she was, she was never as great as Bertha Lewis. Nevertheless her performance adequately puts things over and she is good to listen to. I'm afraid I'm really not a fan of Muriel Dickson. To me, hers just isn't a G&S voice. She gets by with the music, and I know that others have a very strong liking for her, but she doesn't raise my temperature at all. For me this is something of a shame, because Rose can be such a good part on record, but I just don't think she has the extra something that is needed to pull the role off. The lovely acoustic of Kingsway Hall and the spirit with which Sargent conducts, both help to lift a good cast to an even higher level and make this a winning recording. 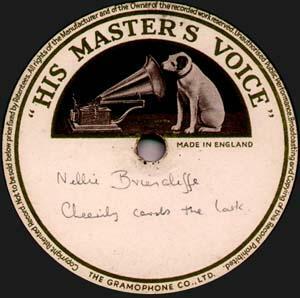 These are scans of the labels of Nellie Briercliffe's own single-sided test pressings of two sides from this recording. The matrices and takes are as published. Also surviving from her collection is one side from the 1928 Yeomen (which see). These precious relics were at some point given by Nellie to a British vicar who contacted Michael Walters and passed them on to him, who in turn has passed them on to Chris Webster. The schedule of sessions for this recording is relatively straightforward. 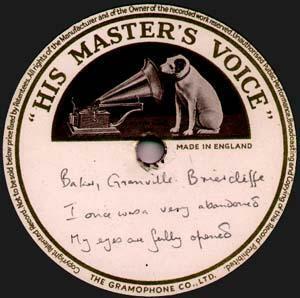 The bulk of the opera was recorded on three dates, in less than a week during September 1931. Just one side required retakes at a later session. The first or second take was published for all but two sides. The same procedure was adopted with the "Bb/Cc" series from 9200 onwards in December 1926 and for all subsequent series.